Are you ready for another DIY this week? I love me some fake eyelashes!! I will never be caught on a night out without them (I can’t believe I just admitted to that after years of telling everyone my eyelashes are real) and love nothing more than to experiment with crazy shapes and colours. To be honest I wish I had a bit more of social lifestyle so I had the chance to experiment more often but sitting all day in my pyjamas and fake eyelashes doesn’t feel the same somehow? I know many of you are thinking, who would wear these on their wedding day but I would and so their must be lots more of you out there with the same eyelash fetish as me? If you wouldn’t want to wear them at your ceremony how about using them for an evening reception look? DIY’ing will also save you a tonne of money as these feathers were in a multipack, so for a couple of quid you create hundreds of pairs of eyelashes in different colours instead of spending that money on just one pair, BARGAIN! Step 1: Take you feather and spray with a little hairspray. This will help with the next step. Step 2: Separate the downy soft part of the feather from the smoother more sturdy part. Step 3: Cut the quill at the point the feathers separate. You can now do away with the soft downy feathers. Step 4: Turn your attention to just one side of the quill. Taking it a feather at a time, pluck all the way along the quill until you are left with just one half of the feather. 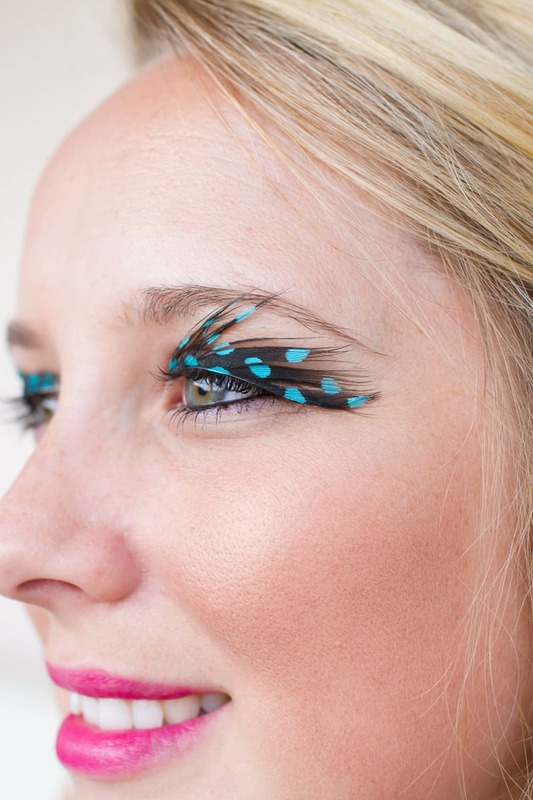 Step 5: Using a pen or pencil, wrap the feather around until you have a slight curve in the quill as you would find on the ridge of fake eyelashes. Step 6: Heat your curling tong or hair straighteners and curl the edges of your eyelashes until you have the effect your desire. I wanted mine to be a little more edgy so I made them spiky rather than curled. This part is up to you! Step 7: Take your eyelash glue and spread across the the quill edge of the eyelash, just as you would fake eyelashes. Step 8: Now you are ready to glue the eyelashes to your eyelid, again using the same technique as you would with fake eyelashes. Apply the feather to the eyelid, close your eyes and firmly press down on each corner for a few minutes until the eyelash is securely in place. Repeat all the above steps with you second feather. I want to see you all in feathery eyelashes please, post your images to Instagram using the hashtag #BESPOKEBRIDEDIY.